One in three Americans do not have a park within a 10-minute walk from their home. In today’s demographically diverse, screen-obsessed, environmentally disconnected world, this presents challenges. As more and more people flock to cities — 82 percent of Americans now live in urban areas — fewer and fewer of them are spending any substantial amount of time outside. In fact, according to an EPA-funded study, Americans spend 93 percent of their lives indoors. 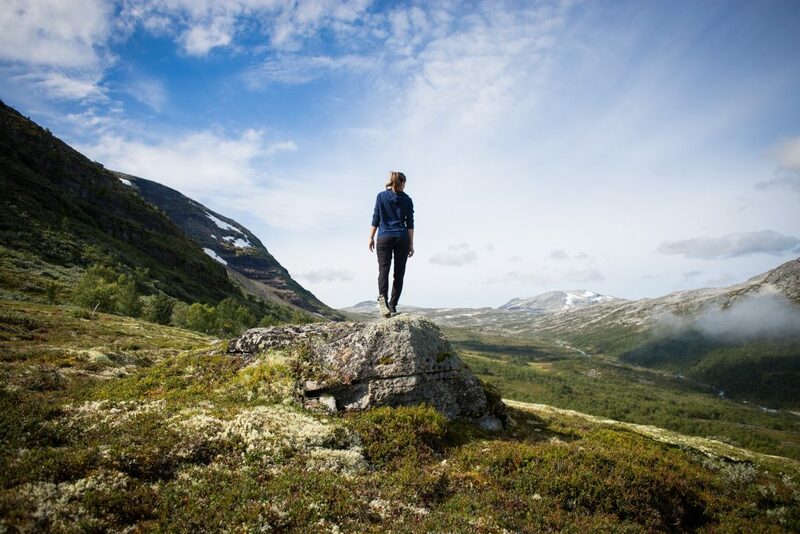 This lost connection with nature means that not only are fewer people reaping the benefits that come from time spent outdoors but that support for conservation is not necessarily infinite. Instead, it’s something that must be cultivated. It’s not that urban green spaces don’t exist. According to The Trust for Public Land, the 100 most populous cities in the U.S. boast a combined 2 million-plus acres of park land. The challenge of improving city dwellers’ connection with — and thus their willingness to advocate for — nature often comes down to knowledge, comfort and access. “If no one ever took you fishing, camping, hiking or biking [as a kid], you are probably not going to be inclined to take your children as you grow older. We are now a generation that spent a lot of time playing video games and a lot of time on our phones, so maybe you never went outside and now you don’t want to look silly so you don’t go out,” says Linda Walter, director of the Michigan Outdoor Adventure Center (OAC) in Detroit. Opened in July 2015 to “inspire, educate and connect” Michigan residents with the outdoors, the center is meant to serve as a stepping stone for individuals whose knowledge of and comfort in the outdoors is limited. “We want to inspire people to do things they didn’t even know they cared about until they got here, show them how to do them and then connect them to places around the state to do those things,” says Walter. 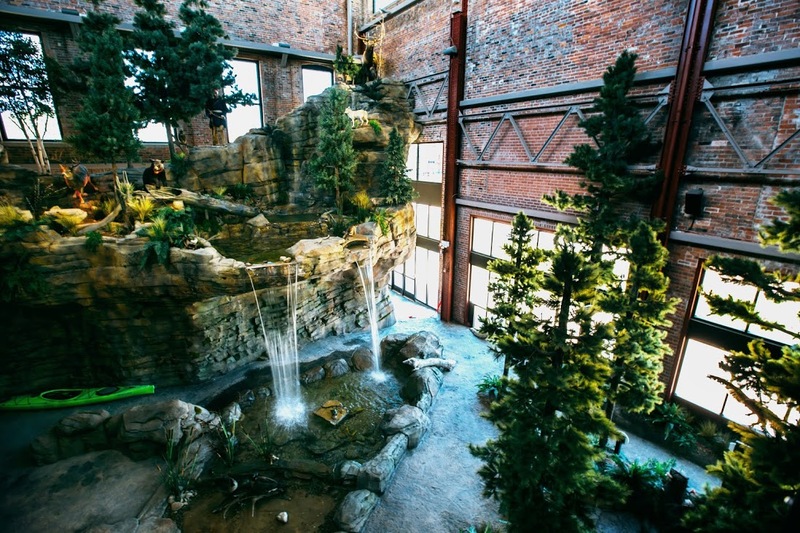 From a cave, waterfall and large aquarium stocked with native fish to kayak, ATV, snowmobile, bicycle and fishing simulations (the fish actually “bite”), OAC’s exhibits introduce visitors to the many wildlife species, geographical formations and outdoor activities of the state. Additional exhibits include a 38-foot-tall life-like Pin Oak made of a mix of foam and polymer concrete. 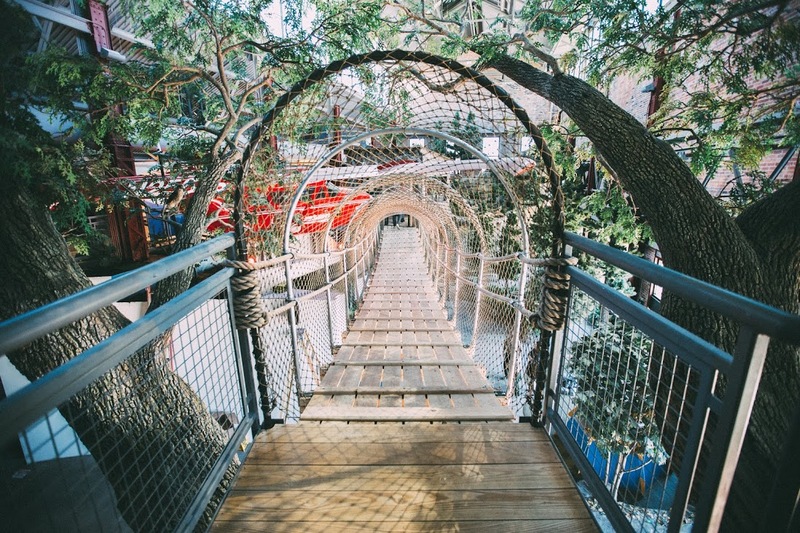 Its “hidden” staircase, which winds up the inside of the trunk, and exposed roots make it both a fun and educational experience for kids, Walter says. A sustainable living house on the second floor — equipped with a garden, composter and beehive — demonstrates the ways in which visitors can be good conservation stewards in their own backyards and homes. And that is the whole idea. OAC offers both indoor and outdoor camping events for individuals interested in taking that next step. It hosts two annual outdoor campouts and loans equipment to those who need it. “We have had people, success stories of people who camped with us using loaned equipment, who came back with equipment they purchased and are now camping in the state park system,” Walter says. Located at the intersections of the Dequindre Cut Greenway (a park along a former railway line), William G. Milliken State Park and Harbor and the Detroit Riverwalk, the center is intentionally accessible. The Michigan Department of Natural Resources, which operates the center, created it to increase both its reach and offerings for city residents. Its location is meant to both entice those in the surrounding outdoor public areas to come inside and those inside to go out. “We kind of consider ourselves the wreckroom of the Detroit Riverwalk, where in the winter or in inclimate weather, [you come here,]” says Walter. The center is accessible not just in location, but also with regard to its prices and accommodations. “We have extremely reasonable prices,” Walter says, “and they’re extremely reasonable [compared to] anywhere in the nation.” Admission is $3 for children and seniors and $5 for adults. Families of up to five people can also purchase an annual membership for $50. Walter says she also maintains a focus on ensuring that the building is accessible for people with specific needs, such as those who are hearing impaired or who don’t speak English. The center has maps to the building in 11 languages and is in the process of updating signage to include Spanish and Arabic. Walter says attendance has increased every year since opening, and in 2018, OAC hosted 120,000 people. With the help of corporate partners and a newly created friends group, the center is working on the development of new exhibits, and Walter hopes to secure enough funds to offer transportation grants to get people out into Michigan’s state parks. The U.S. Fish and Wildlife Service (FWS), also understanding the importance of building support for nature, wildlife and public lands, began an effort to create what Angelina Yost describes as a “conservation constituency,” following a visioning process in 2011. Part of a long-term strategy, which the agency called Conserving the Future, the objective is to improve the way the agency is connecting with communities to ultimately build a network of people who will support conservation into the future. For this, FWS set its sights on National Wildlife Refuges. FWS saw urban areas as an opportunity to make the agency’s dollars go farther. This understanding led to the development of the Urban Wildlife Conservation Program, an outreach initiative that encourages urban refuges to form better connections with diverse members of their local communities. FWS came up with a list of 101 refuges that are within 25 miles of populations of 250,000 or more to include in the program. Ranging from as far away as Anchorage, Ala., to Florida, the refuges vary not just in their own geographic and ecological makeup but in the makeup of the communities in which they are located. Staff at these refuges have been encouraged to develop partnerships with community organizations and to secure grant funding to support their efforts, which include hosting activities and programs. Thus far, Yost says, 29 refuges have received small grant funding. Part of this work involves first determining the barriers that prevent people from getting out in nature — No. 1 in the program’s Standards of Excellence. Yost says barriers often vary from one city or community to the next. However, some of the most significant ones, no matter a refuge’s location, have been accessibility, such as for those who have a disability or don’t speak English; wayfinding, meaning issues with signage; and limitations on activities. Fear of nature and safety follow those. 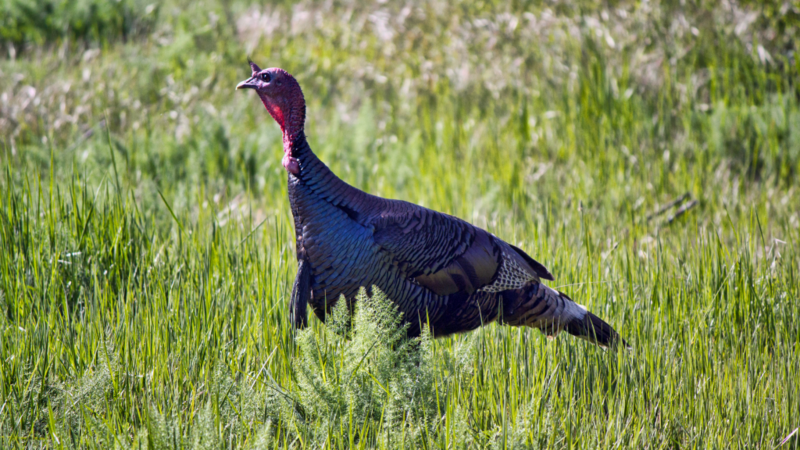 “This is an internal problem, but refuges have been established for protecting species — sometimes an endangered species or for the management of hunting areas,” says Yost. This often means that the only type of activity allowed is nature watching and/or hiking. By allowing more and different types of activities, she says, they’ll begin to attract people of varying interests and backgrounds. “If we want to attract a larger, more varied crowd with diverse perspectives,” says Yost, “then we can’t just open up for bird watchers.” The same is true, she adds, of events. 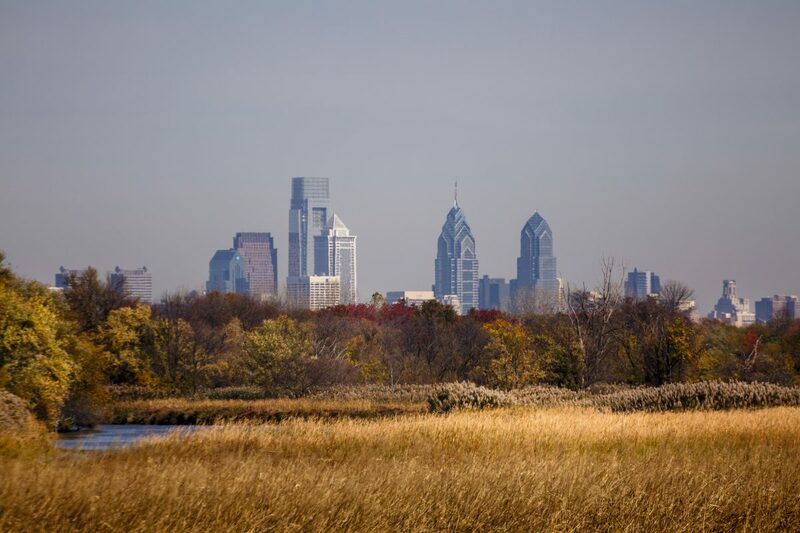 The city of Philadelphia has embraced the Urban Wildlife Refuge Program through the John Heinz National Wildlife Refuge, which sits on the southern edge of the city. Some refuges have attempted to address the barrier of fear by providing tame outdoor spaces that slowly give way to wilder areas. In the St. Paul and Minneapolis, Minn., area, one refuge has created a seamless stepping stone to the outdoors. Through donations made by companies such as Bass Pro Shops, refuges have been able to loan equipment, such as rods and reels or bows and arrows, to residents to participate in activities like hunting and fishing. When it comes to attracting more people to pastimes like hunting, because of its strong heritage — fathers passing it down to their sons, for example — Yost says reaching communities that haven’t previously been introduced to the sport is critical. “To move the needle, you need to start diversifying who you work with, not just always go to the same audience,” she says. Through its Standards of Excellence — of which there are eight — the Urban Wildlife Conservation Program strives to provide best practices for how refuges and their partners can better engage with their communities. Beyond getting to know and relate to your community, others include providing equitable access, being a community asset and making visitors feel safe and welcome. “These are things that we think are foundational for really developing a good relationship with your community that benefits conservation, the refuge and the community all at the same time,” says Yost. FWS hopes that by following these standards and improving urban populations’ connection with nature and wildlife, urban residents will eventually become advocates and good stewards of our natural resources. Connecting people with nature is important, but if there are no outdoor spaces to visit, achieving this is difficult. That’s why integrating nature into the urban fabric is the mission of Urban Greenspaces Institute, a nonprofit based in Portland, Ore. Founded by Mike Houck in 1999, the institute’s efforts are concentrated in the Portland-Vancouver region of the state. At the time of its founding, the value placed on urban green spaces by the organization was not one that was shared by local government. “Their attitude toward urban nature was that it was basically trashed and not worth putting much energy into,” Houck recalls. After some convincing by Houck, however, Metro — as the regional government of Portland is called — decided it, in fact, should play a role in natural resource protection, restoration and management. Much of Urban Greenspaces Institute’s work involves shifting attitudes about nature, which it accomplishes in several ways. “Endless pressure endlessly applied” is the phrase Houck uses to describe his approach. “In other words, none of this happens overnight, so you just have to be willing to be in it for the long haul and keep tugging along,” he says. One way he has attempted to do this is by working to get the Great Blue Heron adopted as the city bird — something that Houck says may sound trivial but that makes a difference. 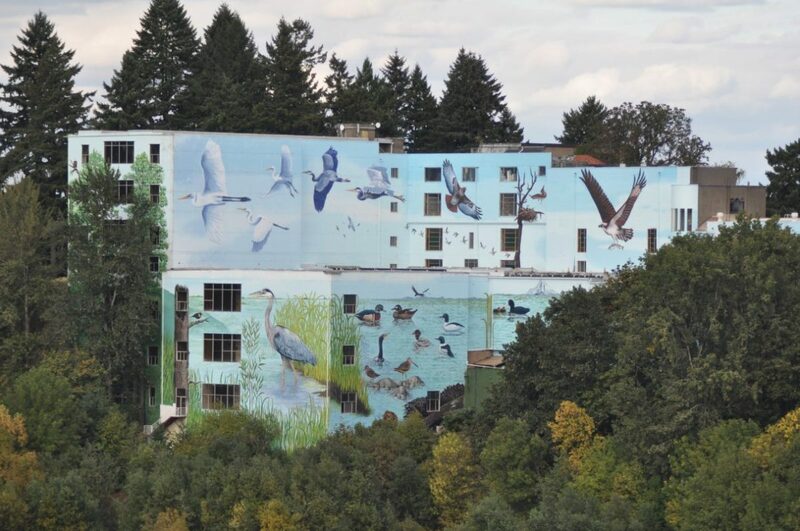 “Every year since 1986, I’ve worked with the mayor’s office to write up a proclamation that city council adopts during Great Blue Heron Week that lays out very specifically what we’ve done in the past and what we need to do over the course of the next year to ensure that Great Blue Herons continue to inhabit the city of Portland,” says Houck. Additionally, he and his colleague, Ted Labbe — who will take over as executive director for Houck this summer — have published books, which detail where people in the Portland-Vancouver region can go to find nature or wildlife near their homes. They have also hosted conferences and symposia and led field trips. By partnering with government and other nonprofit organizations, he says, Urban Greenspaces Institute has had “an accumulative, collective impact” on the region. In the 30-plus years he’s been doing this work, Houck says he has never seen such a groundswell of support for this work as he is witnessing now. Because of the diverse makeup of cities, urban access to greenspaces is also innately about ensuring equitable access to nature. Parks and natural areas help improve the health and quality of life of residents as well as property values. 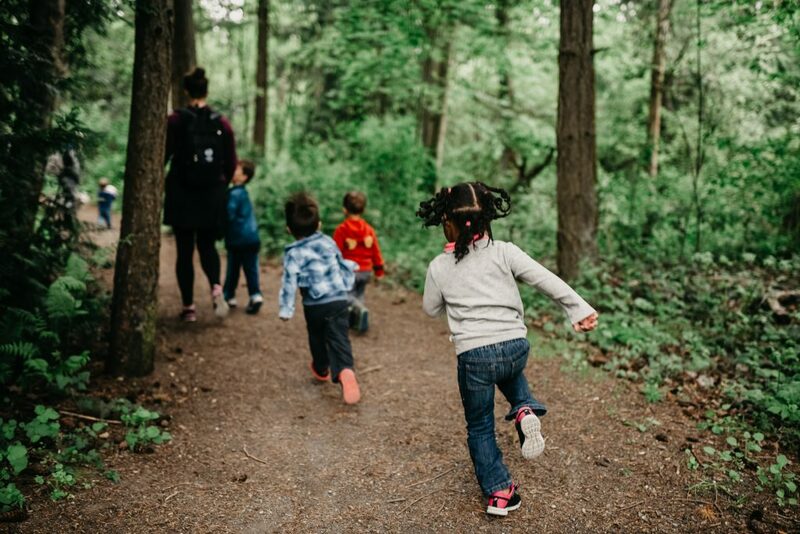 Yet humans overall are increasingly disconnected from nature, with children spending an average of only 4 to 7 minutes outside each day, according to a report from REI. Yet forging a connection with the natural world is not just important but also inherent, Houck says. Perhaps that’s why some doctors are prescribing what’s now being referred to as “forest bathing” but was once simply known as a walk in the woods.